The home mortgage interest tax deduction is a major benefit of home ownership. Right? The mortgage interest deduction may be the largest individual deduction available — it saved taxpayers $69.7 billion in 2013, according to the Joint Committee on Taxation — but that doesn’t mean you’ll benefit significantly from it, if at all. Studies show you’re most likely to benefit from the deduction if your household income is more than $100,000 a year or if you live in an area with higher housing costs, such as the West or East coasts or a major city. 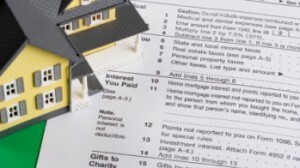 Taxpayers can only claim the mortgage interest deduction if they itemize. And it only makes sense to itemize if the sum of your individual deductions exceeds the standard deduction, which for the 2013 tax year is $12,400 for married couples filing jointly, $6,200 for singles and married individuals filing separately, and $9,100 for heads of household. Along with mortgage interest, you may itemize deductions for things like property taxes, charitable donations and, in some cases, mortgage interest. For anyone who purchased a less expensive home, has an extremely low mortgage interest rate, is a number of years into a home loan and/or is filing jointly, interest payments will be less than or barely exceed the standard deduction. Lots of homeowners fall into one or more of the above categories, which is why it should be no surprise that a Pew Charitable Trusts study found less than half of all homeowners claim the mortgage interest tax deduction. That figure includes homeowners who have paid off their mortgages and have no interest to deduct. But that accounts for just 29.3% of homeowners, a recent Zillow.com study found. Still, the National Association of Homebuilders says seven out of 10 homeowners with a mortgage claim the deduction in a given year. That’s a huge majority, even if all deductions aren’t created equal. The first and second years of home ownership have the greatest potential for tax benefits, because monthly mortgage payments at the beginning of a loan are almost entirely interest. Also, taxpayers can usually fully deduct any points they paid to reduce their mortgage interest rate in the tax year they buy the home. But since interest payments gradually decrease over the life of a home loan, homeowners in the later years of paying off a mortgage might lose their mortgage interest deduction. The standard deduction might provide equal or greater tax savings. Another common misconception relates to the difference between a tax deduction and a tax credit. A tax credit reduces your taxes dollar for dollar. If you get a $2,500 tax credit, your tax bill will be $2,500 lower. The tax benefits associated with home ownership are deductions, not credits. They reduce the amount of your taxable income. Their dollar value is equal to the amount of the deduction minus the standard deduction times your marginal tax rate. So, if you have tax deductions of $15,000, you are married filing jointly and you fall into the 25% marginal tax bracket, you aren’t saving $15,000 on your tax bill. You also aren’t saving $3,750 on your tax bill ($15,000 x 25%). You’re saving $650 ([$15,000 - $12,400] x 25%). In fact, the Reason Foundation, a libertarian think tank, found the average amount homeowners saved thanks to the mortgage interest tax deduction was just $615 in 2012. In the past, when interest rates were substantially higher (such as in the 1980s), the deductions were worth much more, but homeowners should still understand the true level of tax savings that home ownership brings, how these savings are calculated and that these savings are often overstated, even by financial and real estate experts. The bottom line is that buying property to get tax benefits is the wrong reason to buy property. The additional expenses associated with owning property will probably offset any tax benefits you receive. And advice that you shouldn’t pay off your mortgage early because you’ll lose the tax deduction is just wrong. It doesn’t make sense to pay a dollar in interest to save 25 cents on your tax bill.